But I have a problem, the pic kit not found the PIC, so I used IPE of mplab... so in IPE the pic only let programming if I not select "Configuration Memory" in advance option... the software say "programming complete" but the pic no running. Some help for can use this pic? before I used this pic but wit other encapsulated and not Low voltage.. and all was ok... and the pic kit found it normal. #use delay() statement. Change it "clock" or "internal". If you keep the INTRC_IO fuse, then you need "clock". I cant record the hex in this low voltage pic. So what is the way to program that pic with the pickit? If you're using MPLAB and a PICKit3 the following works.. However what PCM P says is true, your code has the wrong xtal selection, you cannot say 'crystal' as then the PIC will expect to see a real xtal (and caps) attached to it. Yes, but still no running... I did as you said, but the mplab say "ok"
PICkit 3 is not in programmer-to-go any more. PICkit 3 is now in Programmer to go mode. The next time you connect to this unit, you will have the choice to take it out of Programmer to go mode. be sure 'debug' is NOT selected. 2) I have NO idea how or why 'programmer to go' got selected. I've never ever used it. Perhaps someone who has will be able to help. But I have a problem, the pic kit not found the PIC.. It's actually the smaller brother to the 18F46k22 I use daily. If you need to update,you'll need to goto the Microchip website and see how it's done. I haven't for several years but if you have a choice, select firmware 1.27.20. BTW my version of MPLAB is 8.86. OK, found my 26k22 test PCB and the above code works 100%. The PICkit3 supplies 3.299 volts and LED flashes at 1HZ rate. Please note the comments after the clock selection. When you say 'crystal', the compiler assumes you have a crystal and caps attached to the clk pins but you don't, you're actual wanting to use the internal osc peripheral. 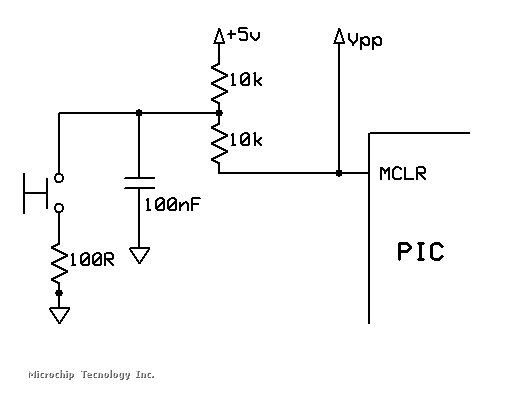 The only minor changes to your program is the #define LED PIN_B0. Simply change PIN_B0 to PIN_C5, compile and it should work for you. By using the #DEFINE, you can save a LOT of typing and MIStyping !! If you put the LED on another pin,you only need to change the one DEFINE not a lot of other lines of code. Also I commented out(removed) lines the compiler defaults or inserts for you. BTW the PICkit3 automatically chose 3.299 volts not me. Thanks you, but no work. Its rare, I can read and erase the device, but the pic no let programing, on PCB I only have the PIC and one led on C5 for make the testing, I probe all router with the multimetre and all is ok.
Its rare because with the version 18F26K22 I have not problem, but with the low voltage version yes. The mplab say "configure LVP pin on pickit" where I conect that pin... maybe I need that pin..? 2018-02-19 10:01:43 -0500 - Hex file loaded successfully. also there is an option in the programmer menu to check that the fuses are controlled by the program instead of MPLAB. 2nd what version of MPLAB are you using ( I'm V8.86), as I don't get a lot of 'text' about what's happening. 4th be sure to select 'power from PICkit3' option. It has more than enough power to flash the LED and that's how I tested it, powered from PICkit3. What circuit have you got on your MCLR connection?. What is being described is 'classic' for a board that has a too small resistor on this pin, or a capacitor connected directly to it. The programmer has to be able to pull this pin up to Vpp, reasonably quickly. Look at Figure 2-4 in the PicKit3 users guide. If you want a capacitor on the pin, it needs to be connected via a resistor not directly to the pin. Programming is not going to work, till reading the device ID works. The problem is communication, I don't understand what I need the pic to be read. The 0.1uF may well stop the programmer from working. Some sites show the direct capacitor, and some programmers are powerful enough to work with this, but a lot are not, especially USB powered ones. The 100R resistor is not necessary but increases the life of the switch. What programming program are you using? I have MPLAB 8.86 controlling a PICkit3 and do not get any of your posted messages. 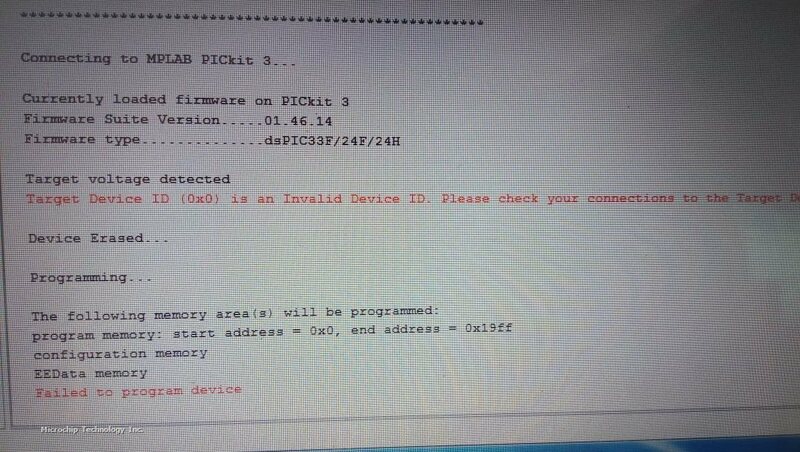 It appears to me you may have a 3rd party program controlling the PICkit NOT MPLAB ? I did see a google hit about the 'stand alone PICkit3' program 'taking over' and NOT allowing MPLAB to function correctly. Please post what your complete hardware and software consists of. As for the _MCLR connections. On my 46K22 setup, it's just a 4k7 to Vdd, for the test 26K22, it's a 10K to VDD with a 1K in series to the MCLR pin. NO capacitor on either board. I get the problem... My PCB was bad, I no saw the datasheet and the QFN name pin, its diferent to SOIC. I make PCB with Proteus... and I no saw that was different. Good news, you FOUND out why ! All my projects are done with DIP style PICs. While I can no longer read the part number on them, I can just make out the pin one 'dimple' to be sure it's inserted into the socket properly. Bad news, you've found another reason why Proteus cannot be trusted. It SHOULD have known about the different pinouts between PIC packages! Hopefully you can get the PIC to flash the LED and continue soon !